China's Xi Is Elevated To New Level, With Echoes Of Mao : The Two-Way A new Community Party amendment sets President Xi Jinping's "thought" alongside Marxism-Leninism and "Mao Zedong Thought." State media say it'll help China avoid the "Tacitus Trap." Applause rained down for China's President Xi Jinping on Tuesday, as the Communist Party of China adopted his "thought." Xi (bottom center) was flanked by former presidents (from left) Hu Jintao and Jiang Zemin, along with Premier Li Keqiang. If he returns as expected, Xi, 64, would turn 68 while in office — putting him outside of China's norm of not allowing leaders who are older than 67 to hold power. Many have been watching to see how Xi handles the age convention as it applies not only to himself but to his allies and aides. 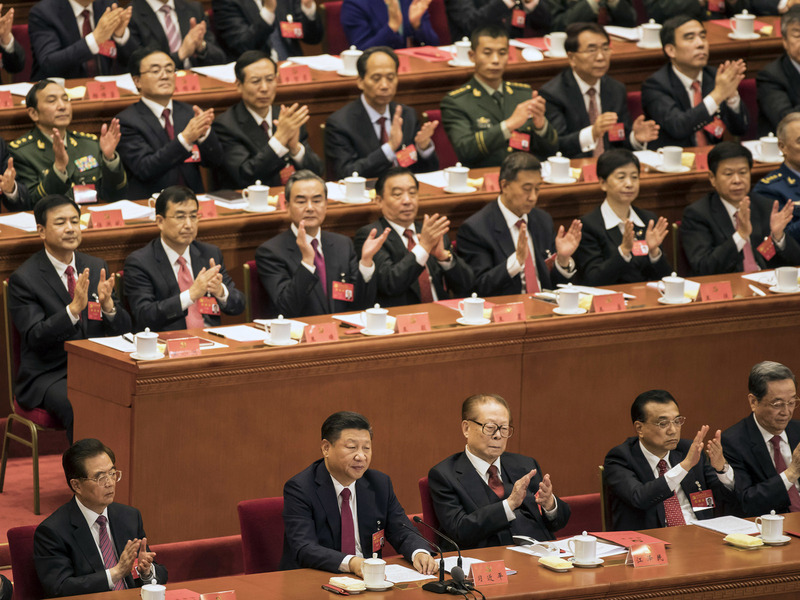 Under the age norm, several members of China's Politburo Standing Committee are due to retire before the new lineup is formed that will lead the party — and country — for the next five years. The big event brought an expansive treatment by Xinhua, which cast Xi's enshrinement in party doctrine against a broad historical backdrop. "Experts widely believe the development of socialism in China shows theoretical innovations by the Chinese leadership will not only help the country avoid history's cycle of rising and falling and the 'Tacitus Trap,' but offer an alternative answer to such predictions as the 'end of history,' by Francis Fukuyama, who argued for the inevitable triumph of Western liberal democracy." The "Tacitus Trap" has been a recurrent theme in China in recent years, often mentioned in conversations about maintaining the government's credibility — particularly in the digital age. On the Web, all of the top Google results for the term refer to its use in China. Tacitus was invoked on a wide scale as far back as 2012, when China Daily reported, "'Tacitus Trap' warns any leaders in power that when a government loses credibility, whether it tells the truth or a lie, to do good or bad, will be considered a lie, or to do bad." In that piece, China Daily cited "Publius Gornelius Tacitus" — a typo that has lived on in China, as British ancient history professor Neville Morley notes. Writing about the phenomenon, Morley adds, "And of course no one has ever heard of the Tacitus Trap." Morley has added several updates to his original post about the term, which has opened discussions about its authenticity and validity. "Meaning is realized at the point of reception; if this reading of Tacitus offers a useful means of interpreting Chinese political dilemmas, what does it matter that the West has failed to recognize the usefulness of the principle (or has forgotten it, if indeed the original source for this is Bacon or other early modern readers of Tacitus)? The idea of different cultural traditions of reading the classics, with complex interactions and debates, is so much more exciting than the idea of a single worldwide tradition or set of conventions."